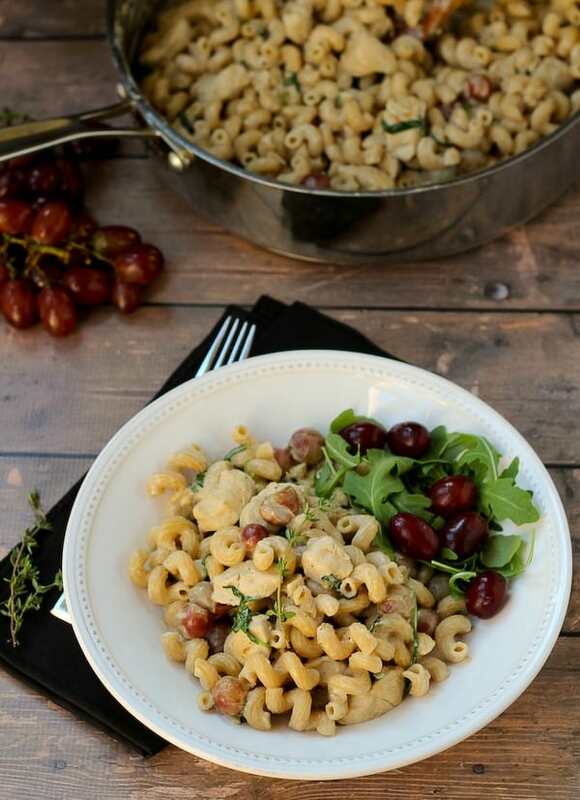 This pasta with a tangy and rich creamy Dijon sauce will delight everyone when they find sweet red California grapes alongside chicken and arugula. 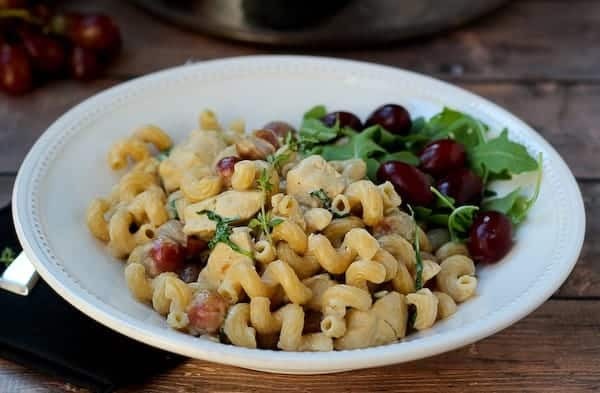 When Grapes from California* asked me to fall in love with grapes by creating a fall-inspired entree recipe using grapes, I immediately thought of this pasta with a creamy Dijon white wine sauce, juicy red grapes and healthy lean chicken. Going into the Thanksgiving season, I wanted to take a minute to talk about thankfulness. One thing I’m thankful for is the opportunity to sit down with my family nearly every night and have dinner together. Of course, sometimes it’s meeting Ben at a restaurant before he jets off to a football game. And sometimes it involves toddlers whining. And there’s often food on the floor. And sometimes the kids don’t want to eat anything I make. But I am so grateful that I get to sit down with my husband, son, and daughter and enjoy a meal together. We give thanks for our food. My daughter E (she’s 4-years-old now if you lost track, I practically have) loves to pray before dinner. She always thanks God for rainbows, butterflies, and flowers. Always. If she forgets to say one of those things, she makes us stop eating while she prays again. I’m so happy that even at a young age she has an attitude of thankfulness and joy. I hope and pray that never changes. Going into the Thanksgiving season, be especially mindful of thankfulness. Whatever it is that you’re thankful for, take some time to really enjoy it. Maybe it’s that shiny new car you have in your driveway. Go for a drive and look at the fall leaves while you bask in the smell of your leather seats. Or maybe it’s that a friend or family member has been declared cancer-free. Now that is something to be thankful for. Or maybe it’s something as small as the flowers and butterflies — the little things that make life a little brighter. Celebrate them as a child does. One recent meal that my family and I sat down and enjoyed together (after giving thanks for the food, butterflies, rainbows and flowers of course), was this pasta with California grapes, chicken and a creamy dijon sauce. You might be raising your eyebrows at the thought of mixing red grapes with chicken and pasta but I’m telling you, it works. The sweetness of the grapes is such a terrific contrast against the richness of this dish and the tangy spiciness of the dijon mustard. The grapes brighten the dish and are an unexpected pleasant surprise. 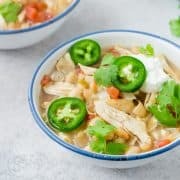 This worked great for a weeknight meal for us but it would also be a pretty impressive meal to serve to guests. It’s easy to make and completely manageable. Look for plump grapes with pliable green stems. Keep grapes unwashed and refrigerated until ready to use, then rinse with cold water and serve or add to recipes. Grapes from California are in-season May through January—perfect for mixing into all of your favorite snack and recipes throughout the year. Grapes of all colors – red, black and green – are a natural source of beneficial antioxidants and other polyphenols. 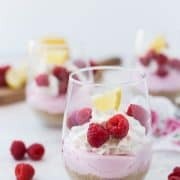 Polyphenols are natural plant nutrients that help promote antioxidant activity and may help promote overall health by helping maintain the health and function of our cells. Research shows that grape polyphenols may help maintain a healthy heart. Grapes and grape products may contribute to a healthy heart by promoting the relaxation of blood vessels to help maintain healthy blood flow and pressure. One serving of grapes (3/4 cup) contains: Just 90 calories, no fat, no cholesterol and virtually no sodium. Grapes are also an excellent source of vitamin K which plays a key role in helping blood to clot in order to prevent excessive bleeding, and may also be important in bone health. 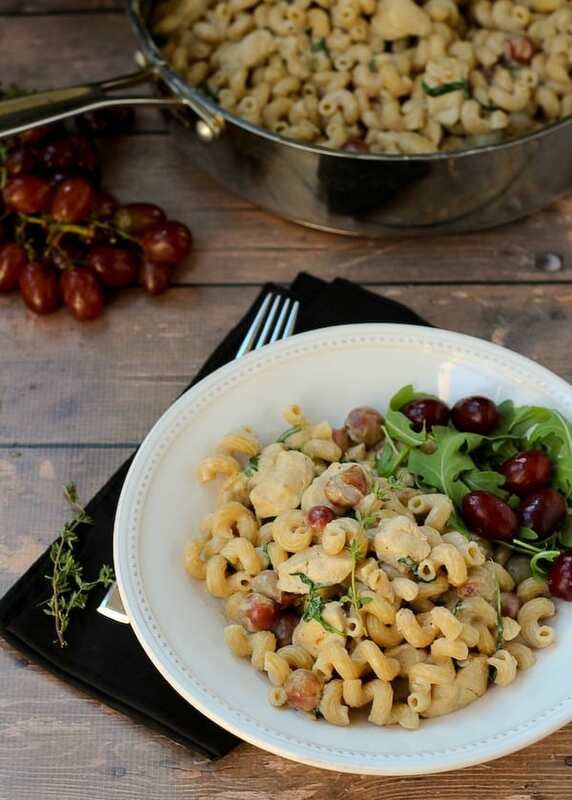 This pasta with a tangy and rich creamy dijon sauce will delight everyone when they find sweet red grapes alongside chicken and arugula. Heat the oil and butter over medium-high heat. Add shallots and chicken, season with salt and pepper. Cook (stirring only a couple times) for about 5 minutes or until golden brown. Add grapes and thyme and continue to cook for 3 minutes or until grapes are begin to split open. Add wine, scrape bottom of pan and continue to cook for about 3 minutes or until wine is reduced. Add chicken broth, Dijon mustard, and heavy cream. Stir to combine. 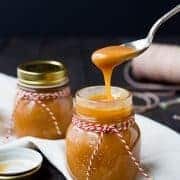 Once simmering, reduce heat to medium-low and continue to cook for 10-15 minutes or until liquid is reduced slightly. In a small bowl, use a fork to mix together cornstarch and water. While stirring chicken and sauce, pour in cornstarch mixture and cook for another 3-4 minutes or until thickened. Remove from heat and stir in arugula and cooked pasta. Serve, with additional arugula if desired. 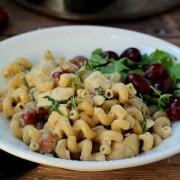 Verdict: Loved the sweet pops of grapes in this decadent and flavorful pasta. Husband’s take: He was a little on the skeptical side but we had this two nights in a row and I heard no complaints. E ate it too! N doesn’t eat anything. Join us November 18th at 9PM ET for a Fall in Love with Grapes from California Twitter party. Tweet with the hashtag #GrapesfromCA. We’ll be giving away six $50 prizes! That’s one every ten minutes! If you want a head-start on the competition, you miiiiight want to know the answer to this question: California produces what percent of the nation’s commercially grown table grapes? (Psst: Answer can be found on Grapes from California’s website or right here in this post.) Answers to all trivia questions during the Twitter party can be found on their website. Be sure to register here to be eligible to win. Ready to fall in love with California grapes? You can also find Grapes from California on Facebook, Pinterest, Twitter and YouTube. *Disclosure: I was compensated for my time to develop this recipe and to participate in the Twitter party. All opinions are as alllllways, my own. When they are in season, we nearly always have a bag of Grapes from California in our fridge. Kids love them, I love them. Thanks for supporting my blog by reading about brands I love! This looks wonderful! I love grapes in savory dishes. I love a good and creamy pasta dinner. This sounds great for the whole family! And grapes is such a fun idea to put in there too! This is my kind of dinner- so awesome! Your wee one praying is just the cutest. I love the sweet and savory combo here. Pinned. My kids love grapes! It’s one of their favorite snacks! This creamy pasta sounds divine! Love all of your grape health benefits!! Asher could eat them every single meal, every single day. Girl, after seeing this I’m falling in love with grapes too :) Looks super yummy! Wow, this is so creative! I never thought about using grapes in pasta. Sounds fantastic. And it’s a lot of fun to think about gratitude. Helps keep us happy! 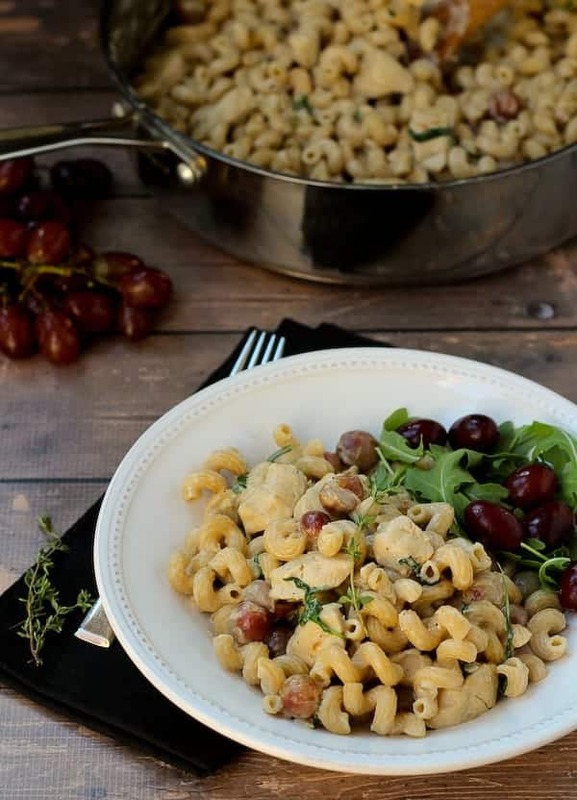 I’m eating red grapes as we speak… But they’d be SO much better in this creamy pasta!